CAPTION: A generous donation given by Livingston County 4-H and FFA board president, David Beck, to the Jerry Litton Foundation board member Ron Wolf, Wednesday night helps the fair exhibitors a large concrete pad between barns. The Livingston County 4-H and FFA Fair board was generous Wednesday evening during a short break at the Country Music Jamboree. A donation of $16,000 was presented to Ron Wolf, board member of the Jerry Litton Foundation. The money will go toward the cost of the concrete pad that was installed earlier this year between the north barn and the cattle barn. 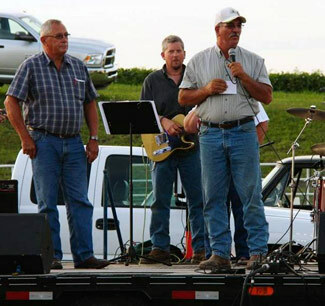 "The concrete allows the moving of trailers in and out easier and also helps with drainage," said David Beck, Livingston County Fair Board president. The fair this year is a history-maker as the weather has cooperated with cooler temperatures and the rain holding back. Featured events have been well attended. The fair continues with events such as the super teen contest tonight and the market animal sale Friday evening. A bid to expand the concrete parking lot at the Litton Agriculture Center near of the Jenkins Expo Center was accepted at the regular school board meeting Tuesday evening. Just over 30,000 square feet of concrete will be poured beginning May 21, 2014, paving around two-thirds of the parking lot area. At the regular Chillicothe R-2 School Board meeting Tuesday evening, a bid was accepted to pour just over 30,000 square-feet of concrete at the Litton Agriculture Center. The bid was accepted from C & R Concrete to perform the concrete addition, which will cost $152,900 to complete. The project will begin May 21 of this year. Superintendent of Schools Dr. Roger Barnes said that since construction of the Litton Agriculture Center began, it has been part of the goal, that as money was available, to continue improvements at the campus. He added that the project will not be of any cost to the district; local foundations will be covering the costs through funds raised and donated. Rusty Black, an agriculture teacher at the Litton Agriculture Center, said that the project will make the parking lot both easier and safer for people to navigate. 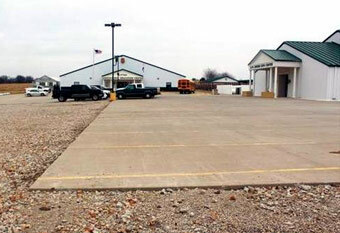 "Through generous donations from area foundations we have been able to add to the concrete parking at the Litton Agriculture Center," Black said. "This will enhance accessibility to the Jenkins Expo building as well as the Litton Agriculture Education building, making it safer and more convenient for school patrons as well as guests that visit our facility." Black said that the gravel, which has made it hard for people to navigate, has had a negative impact in regard to renting out the facilities on the campus. Because people have to park on both concrete and gravel, the parking lot is currently difficult to navigate, and the gravel can be unsafe for visitors who have a hard time walking. "It's been one of our shortcomings on being able to rent and meeting the needs of people wanting to rent the facility," Black said. "We hope these improvements will make our facility more accessible and better for our community." With the completion of the concrete project, it is estimated that about two-thirds of the parking lot area will be paved, with some gravel still remaining.